Yes it's true. 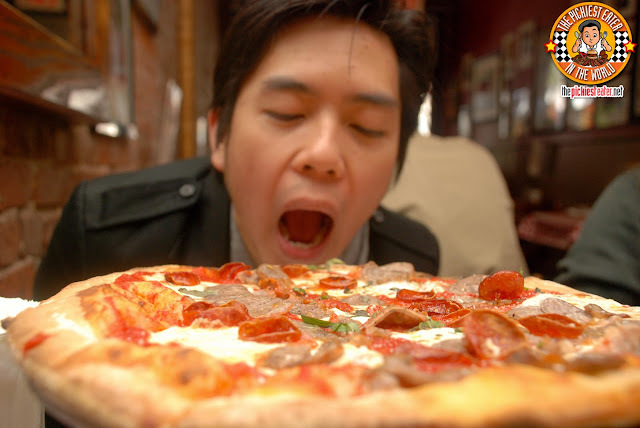 I love Pizza, but Pizza and I can never truly be together. All great tragic love stories have obstacles.. Something that tears our couple apart.. Ours is my hyper acidity. You see, Tomato is my number one enemy. Anything tomato based wrecks my digestive system. Making stuff like Pasta, Tacos, and yes, even pizza, quite tricky for me to eat. All those worries got thrown out the window the moment I found out that we would be going to Lombardi's in New York. Why? Well, it's not everyday one gets a chance to visit the first pizza parlor in America. Our benefactor for the day, Nano was excited to go to Lombardi's from day one. Before I went to New York, I did a little asking around from people who happened to have a knowledge of the places to go to in The Big Apple for some great grub. 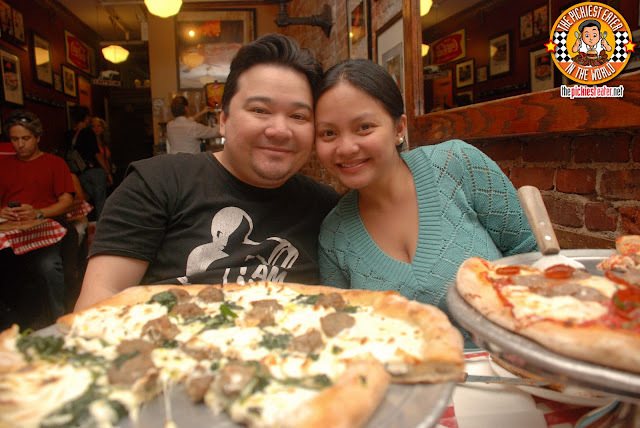 For pizza, two names came up as a can't miss spot.. Grimaldi's and Lombardi's. 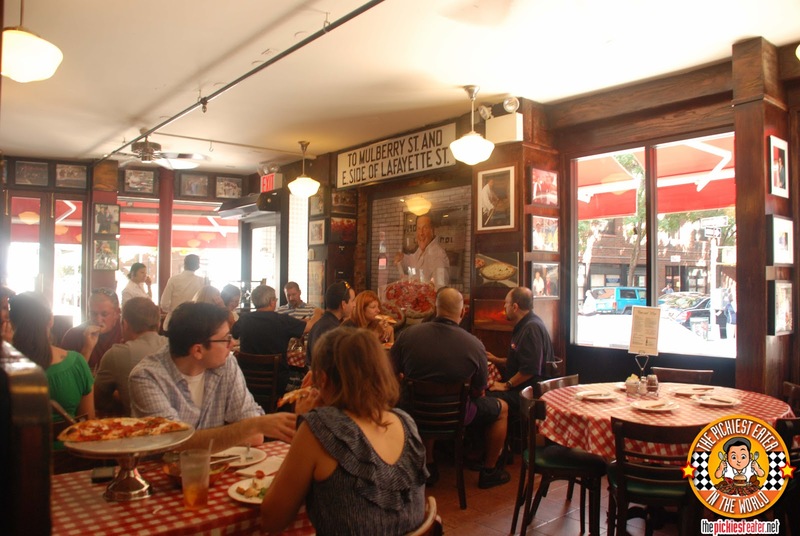 The moment you walk through the doors of Lombardi's, you get the sense of the great history that took place within its walls. I can't imagine that the decors have changed much through the years, because it still looks like a classy Pizza parlor from back in the day. Before I talk about their pizzas, let me just mention that Rina loved their Raspberry Soda. 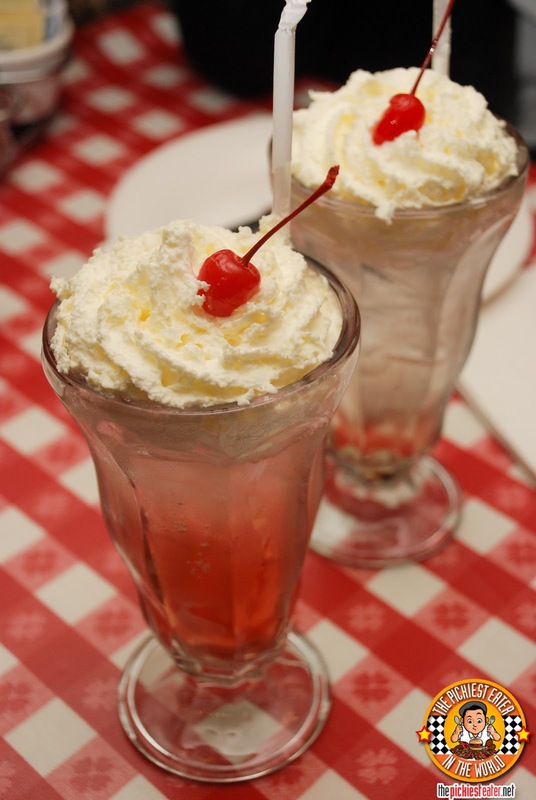 It had a refreshingly fruity sweetness that mixed well with the whipped cream topping. 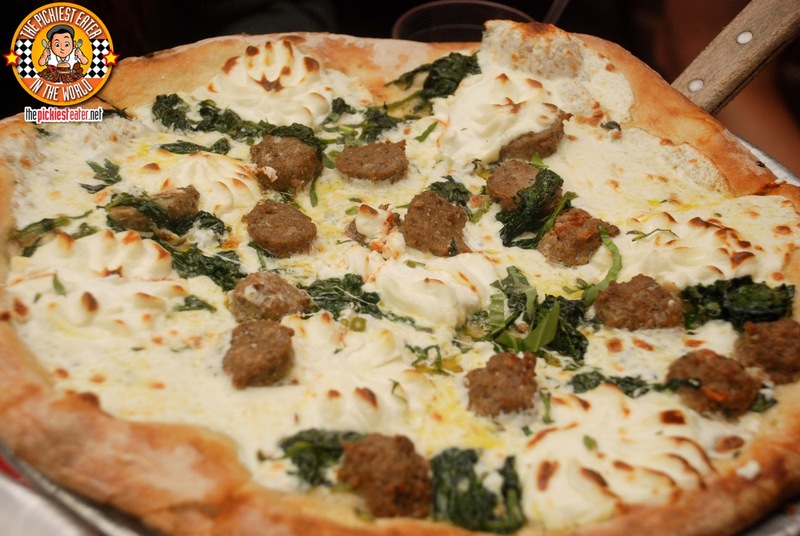 Lombardi's standard pizza has a base of San Marzano Tomato Sauce, Mozzarella Cheese and a topping of Romano and Fresh Basil. 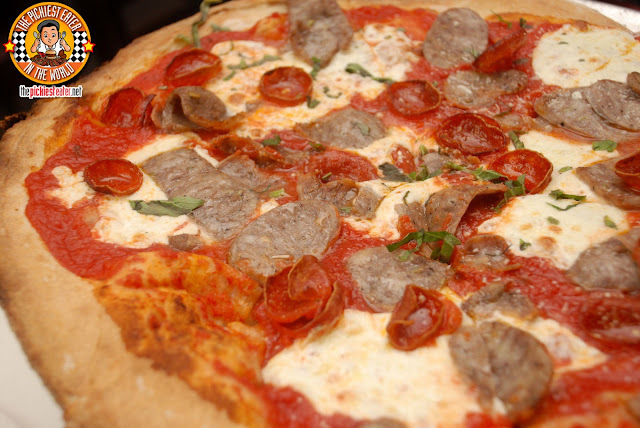 Just for good measure, we added Sweet Italian Sausage, Pepperoni and Roasted Red Peppers. The aroma of the herbs and spices filled my lungs and damn near broke my heart. All of nowhere, Def Lepard's "Have You Ever Needed Some(thing)one So Bad" began playing in my head. I took a small bite of it from Rina's slice, and I was blown away. It tasted as good as it looked. Nano understood my plight and ordered me Lombardi's White Pizza. All of a sudden, I wasn't so pissed off at Tomatoes anymore. Lombardi's White Pizza is topped off with Mozzarella, Ricotta, and Romano Cheeses, the sprinkled with Oregano, Basil, Black Pepper and Garlic Infused Oil in lieu of Tomato Sauce. You know I wasn't going to stop there, so we added some Homemade Meatballs in it, and some Sauteed Garlic Spinach (Trying to eat healthy.. hehe). Without a shadow of a doubt, This was the best pizza I've ever had. 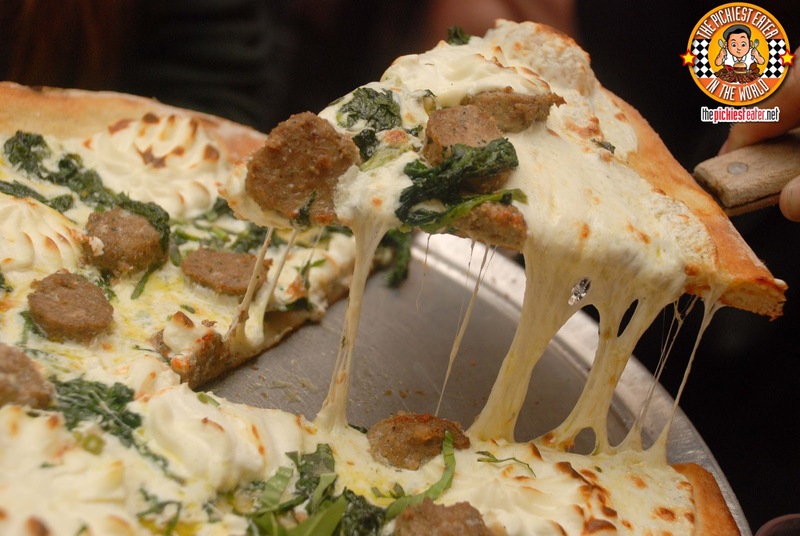 The crust crackled with every bite and had a delectable smokiness to it that made it the perfect base for the pizza. 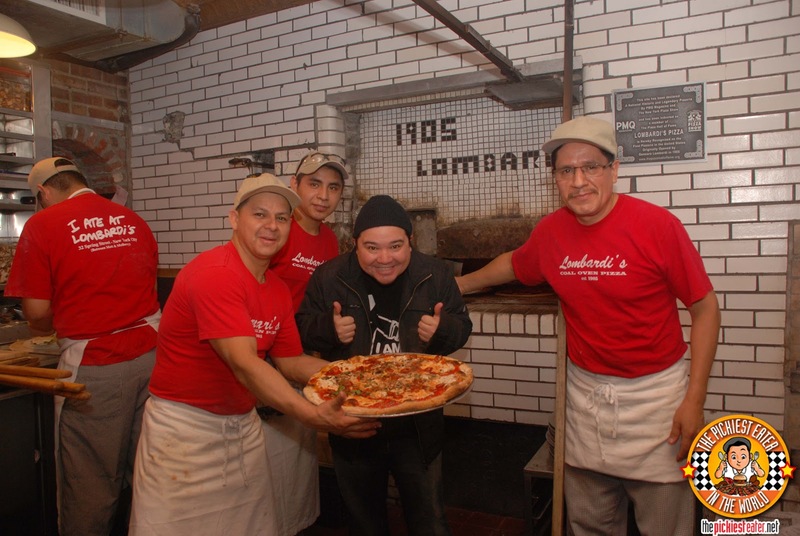 The Pizzas are baked in the same coal oven that was used when Lombardi's first opened in 1897. The combination of the three cheeses brought out a rich creamy flavor that wonderfully swirls inside your mouth, before colliding with the savory meatballs, that had an amazing herb-y flavor. The service was pretty amazing, and when the kitchen Staff saw Rina taking pictures, they immediately offered to take a picture with them by their historic brick oven! 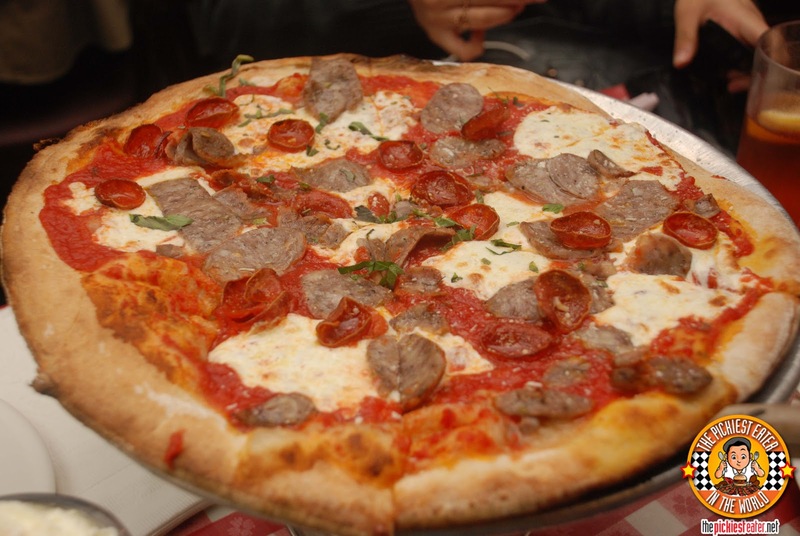 I haven't been to Grimaldi's yet, but I can't imagine having a better experience of authentic New York Pizza than at Lomabardi's!! Me and my Baby... And Rina. hehe. Now that's a pizza! Nothing like the real thing! MERRY CHRISTMAS, FROM THE PICKIEST EATER FAMILY! THE PICKIEST EATER T-SHIRT WINNERS!! WHERE IS UMAMI HAMBAAGU HOUSE? BURGASM AT BURGERBAR IN GREENBELT!